My Beatport DJ chart (July 2013) is available! 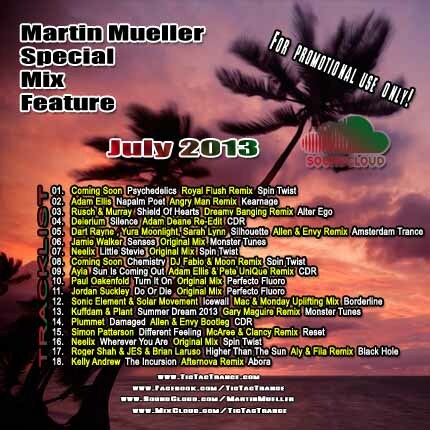 Some tunes are included in my Soundcloud Mix July 2013 aswell! 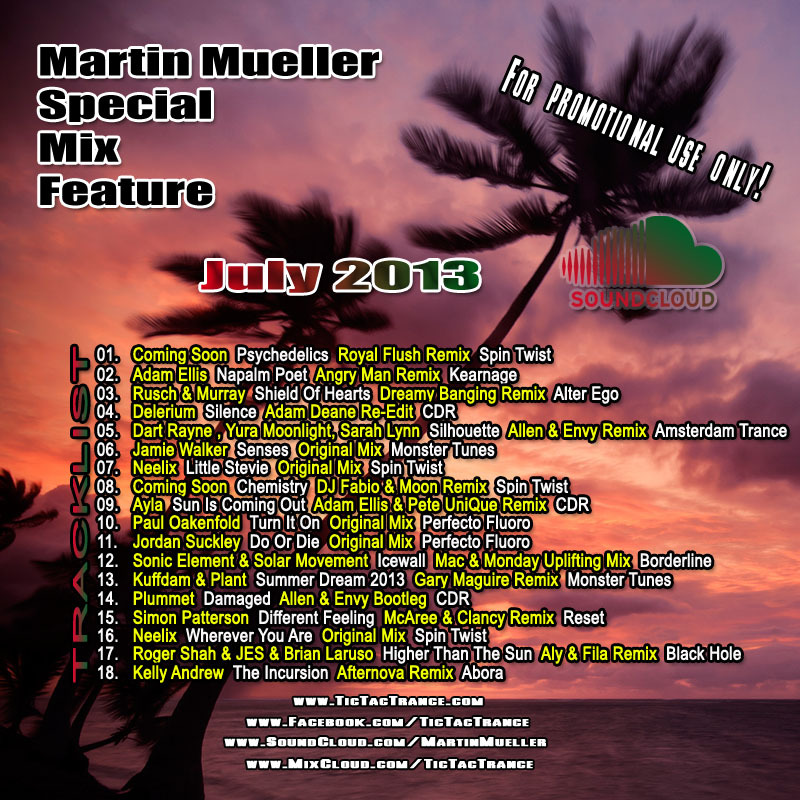 My Soundcloud Mix July 2013 is available! My Soundcloud Mix Series is back with 18 fresh tunes mixed into just one hour! It features tunes and remixes by artists like Neelix, Adam Ellis, Allen & Envy, Coming Soon, Jamie Walker and many many more! It’s now available on my SOUNDCLOUD page. Enjoy! 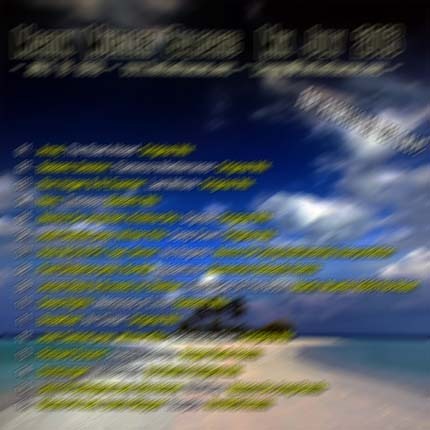 Here’s a special surprise for everyone: because in the last few months Tic Tac Trance didn’t air as supposed to be (delays, not on schedule and so on) I decided to giveaway a very special Balearic Summer CDMIX on my Facebook page. 78 mins, 16 tracks (mostly progressive, downtempo). Before you start to get annoyed: don’t worry, you don’t have to pay with tweet or like or sharing! Just visit my page, it’s there free for everyone! If you like my music and feel to support me, you can add me. Have fun and enjoy the music! Note: because this is a surprise mix, there’s no tracklist (yet). Tic Tac Trance #067 Replay Available! Big sorry to all of you! 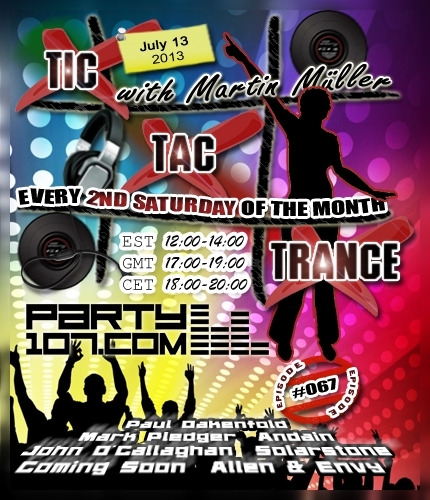 It looks like Episode #067 of Tic Tac Trance didn’t air on the radiostation this time. I’m still trying to get in touch with the station to find a solution for the upcoming months. Anyway, the replay is ready for you now! The new DJ equipment arrived and Episode #067 of Tic Tac Trance is almost here! My show will air on July 13 2013 on Party107 and will feature new tunes and remixes by artists like Paul Oakenfold, Mark Pledger, Andain, John O’Callaghan, Solarstone, Coming Soon, Allen & Envy and many more! This time I’ve prepared a very crazy uplifting, psychedlic and bangin’ 2 hours journey. Make sure to tune in! My show will airs TODAY at 18 CET / 17 GMT / 12 EST.